#MakingTime : Day 2 | Que Sera Sara? Each day we’ll carve out an increasing number of minutes (one minute on Day 1, two minutes on Day Two…) to make time for the here and now and the big picture stuff that gets shoved under the sofa most nights. I’m going to try to write about, or publish my related work, as much as I can. It started September 1, so there is plenty of time to get on board if you want to jump in, too! 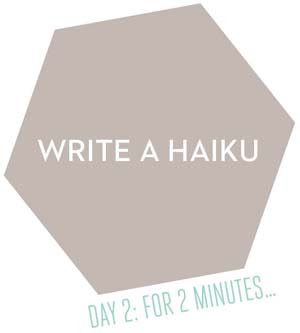 Day Two challenged me to write a haiku. In the fading light, when I could nab a few minutes while Bean walked home from the library and I had closed up my work station for the day, I turned to writeahaiku.com to help me pace out the syllables with minimal counting. In a flash I knew I wanted to capture my moment in the circular park at the end of our road. I’d visited this morning inspired by yesterday’s challenge. I don’t think it took two whole minutes, but that’s not the point is it? When things flow I too often second-guess the simple and easy; assuming things must be hard to be valuable or good was the death-knell of my college experience and a lesson I’d rather not relive. yay! thanks for introducing me to this. I managed not to find the emails for the first two days, so today attempted Day 2 and Day 3 together. And the joy was that Irvine Welsh then re-tweeted my tweeted Haiku. Further joy is that I read about sustainable architecture for 5 minutes at my desk.